Open: Monday to Friday 9 a.m. to 4:30 p.m. Saturday 9 a.m. to 3 p.m. On Sundays, only by appointment. Only two years after the Civil War ended, Woodmere Cemetery was founded by a group of prominent Detroit businessmen that included John J. Bagley (buried here), who would shortly be elected Governor of Michigan. These men felt that Detroit needed a rural cemetery, far enough away from the center of town that it would not be in danger of being exhumed and moved in the future. Of course, the city has grown out to engulf it now. The 250-acre tract they chose had its own picturesque creeks, which had the lamentable habit of running red in the spring due to iron in the soil. According to Gail Hershenzon’s eponymous book about the cemetery, Woodmere was so heavily wooded in the beginning that the “cemetery office’s fireplace always had firewood.” Apparently, coffins were made out of other trees on the property. Some of the lovely old trees remain, but most are gone now. Gravestone blackened by soot from the Rouge River factory three miles away. 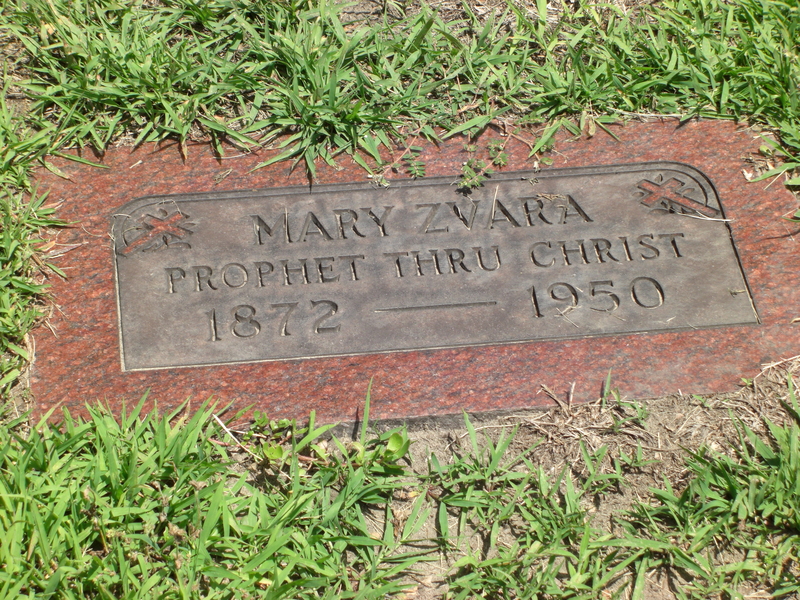 Woodmere’s first burial was Anna Maria Schwartz in November 1868. The cemetery also received some 4000 bodies from the old City Cemetery including, Hershenzon says, a woman believed to have been buried alive during the city’s cholera epidemic in 1833. In 1896, Woodmere set aside 10,000 feet for a military section. 156 bodies were moved from the Fort Wayne graveyard. The fort, which had been built in 1840, had the capability of firing on Canada across the river. Of course, that was never necessary. Several titans of the auto industry lie beneath a modest gravestones at Woodmere. Among them is Henry Leland, a machinist who formed the Lincoln Motor Company and created the Cadillac. David Buick started his company because he’d developed an enameling process. Although he gave his name to the line of cars, he was forced out of his namesake company. Formerly in a modest grave was Hamilton Carhartt, who developed the overalls that bear his name. His granddaughter had a classical mausoleum flanked by angels built and his body was moved in 2000. Woodmere is the final haven for Private Eddie Slovik. Originally classified as 4F (exempt from service because of his conviction for theft) during World War II, Slovik’s classification was changed and he was forced into combat. He deserted twice in France. After he was caught, he was court-martialed and sentenced to die before a firing squad in January 1945. He was the only man to be executed for desertion since the Civil War. His wife fought to have him pardoned and his body returned to Michigan, but Slovik remained in a numbered grave until after her death. In 1987, Ronald Reagan signed an order allowing Slovik’s repatriation, but he has never been pardoned. Brevet General Michael Vreeland is also buried in Woodmere. He fought at Bull Run, Antietam, and Fredericksburg, but was “gravely wounded” at Gettysburg in 1863. All the same, he survived until 1876. His body wasn’t moved to Woodmere until 1911. A mysterious headstone in Woodmere. I wrote about my visit to Woodmere yesterday. 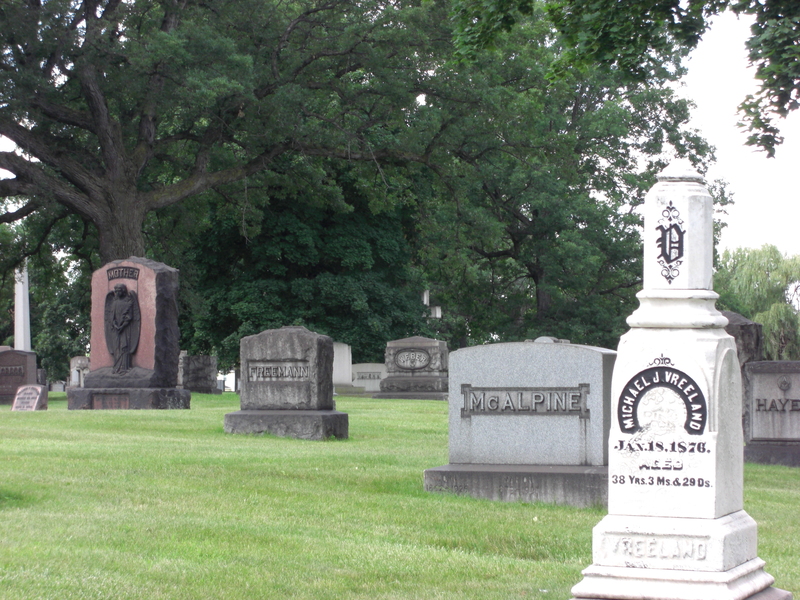 Other Detroit cemeteries on Cemetery Travel so far include Elmwood Cemetery, founded 1846, and reviews of books about Mount Elliott, consecrated in 1841, and Woodlawn, founded in 1895. September 22 walking tour of Woodmere. This entry was posted in Cemetery of the Week and tagged Detroit cemetery, Michigan cemetery, statuary, Woodmere Cemetery. Bookmark the permalink. Love this blog! Look forward to every post! Thanks for all your hard work and research!